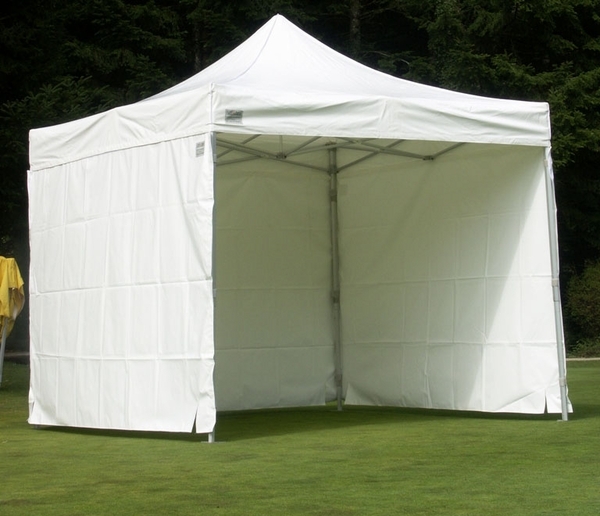 These sidewalls are designed to fit the 15 foot long wall of a Vitabri V3 pop up canopy. It is made of heavy-duty vinyl-1000 denier fabric that weighs 11 oz. per square yard. The material is flame retardant for safety. This sidewall has a guaranteed waterproof design, not just water-resistant like most other canopy material. Attaching the canopy to the tent is easy with 2" Velcro strips that match up to similar strips on the top's interior. The sidewall will provide protection from the weather as well as increased privacy, and you can customize the vinyl to display a company logo or message. Each sidewall weighs 10 pounds. The sidewalls are also available with window and door options.